I recently made a shopping trip to Zara in their Philadelphia location. I have to say that since the last time I've been there, Zara has a lot more of their new collection out on display. The main themes I have noticed with the spring collection at Zara are Black and White, Stripes, Leather, Bold Colors, and Exotic Prints. As I am currently not in "spring mode" yet (and by that I mean buying cute Spring dresses) I picked up a couple of items that I felt could be worn in various different ways from transitioning from the cold weather to the upcoming warmer spring weather. The first piece I picked up is this White Crossover Wrap Blouse which I absolutely adore (retails $59.90). This blouse is very comfortable and looks like it is more expensive than it is. 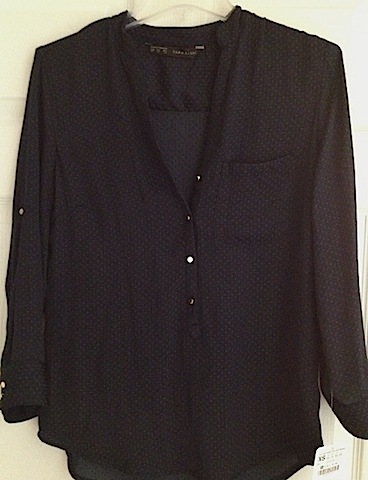 I wore this blouse Friday night paired with dark blue jeans and black pumps. The second piece I picked up is this sweater which I wore to work last Friday with jeans and black flats. The shirt is perfect for a casual look on the weekend and for work since it is on the loose side. The last piece I picked up is this blue blouse which I am planning on wearing either tucked into a skirt for work or with jeans with gold flats for a more casual look. The shirt is somewhat plain but I do love the gold detailing on the buttons which makes the shirt pop.